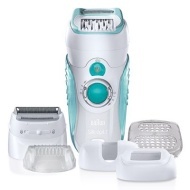 alaTest ha raccolto ed analizzato 15 recensioni su Braun - Silk- pil Wet & Dry Cordless epilator SE9561WD. La media della valutazione per questo prodotto è 4.4/5, confrontata con la media della valutazione di 4.3/5 per altri prodotti. Abbiamo analizzato differenti valutazioni di esperti ed utenti, età del prodotto ed altri elementi. A confronto con altri prodotti, Braun - Silk- pil Wet & Dry Cordless epilator SE9561WD ha ottenuto un alaScore™ complessivo di 89/100 = qualità Molto buono. Really impressed with all accessories and easy to use. I love it! It is fantastic. I love it . Helps me to look good and to forget about shaving or waxing. I will definitely buy any new products from to see how it is. Tried these at a friends house and loved it, was easy to use and felt great! Just need to see if Santa can get me one for Christmas so I don't have to pinch my friends one all the time! Great product,easy to use.Had the Silk Epil 7...very satisfied with the product. The best hair removal on this planet! Does matter if your taking your time or in a rush this is the perfect epilator it's easy to use and it the results are the best out there without paying salon prices. I am very impressed and have already purchased one as a gift for someone for Christmas. Everything about this epilator is great, however, a longer lasting battery would make it perfect.